Sometimes this comes up when a customer ends up with a cable shorter than they expected. So we have put this page together to help clarify. This applies to all cables but only really matters on short ones where you have a tight space. As you might have caught on by now, we are a custom cable shop, which means we build a lot of odd cables. That also means two of those ways to measure get really complicated for mass quick building and wire inventory. Almost every connector type has a different length, and the tip to tip and boot to boot ways get really complicated. 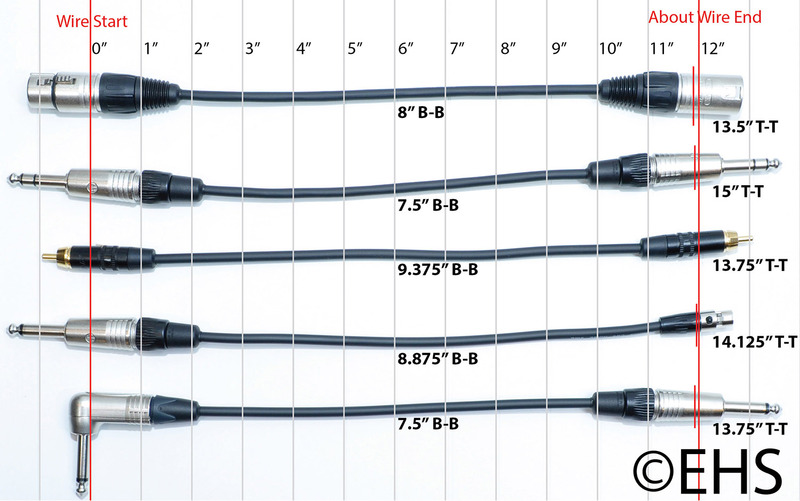 Let’s look at a simple XLR cable. If you wanted a 12” tip to tip cable, then you would need 10.5” of wire and would leave 6.5” boot to boot. If you wanted 12” boot to boot, then you would need 16” of wire and would be 17.5” tip to tip. That’s all good but what if you want XLR to 1/4"? All the numbers change. Plus when you build a cable there is often a slight loss as the wires split out to the contacts, and that varies due to the connector also. A pair of XLRs loses about 3/16” while a pair of 1/4" TRS loses about 1/8", and RCA loses none. As a result, we build by actual wire length which is the middle ground between the two. It makes the build and the inventory simple because the wire is cut to the foot. There are no calculations to worry about- just making the cable. As always we are happy to build your cable to any other standard, all you need to do is ask. We have put together this graphic for a visual on what we are talking about. It has 1” lines and a few cable samples. The lines are approximate because the camera perspective throws things off a little. The measurements are actual measurements from the cables. The two big red lines mark the 12” wire with the short red lines on the right making the actual wire end with build loss.